Water quality monitoring is one of the most important and the most difficult tasks in the field of environmental protection. In accordance with legislative requirements, the aim is to improve the condition of watercourses, aquatic ecosystems and to promote the sustainable use of water. 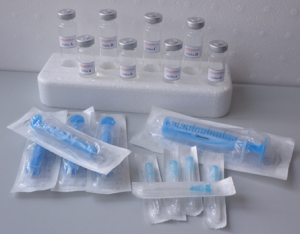 The single-use LentiKatsÒ Cu2+ detection Kit is designed especially for users, operators and technicians in localities where it is not possible to conduct special laboratory determination using instrumental techniques and periodic quantitative analyzes (e.g. galvanic plants, water in remote locations or water in locations without access to expensive instrumentation, etc.). The disposable Single-use LentiKatsÒ Cu2+ detection Kit can be used in engineering, chemical, electrochemical, foundry, glass or textile industries. Copper detection (Cu2+) by using of Single-use LentiKatsÒ Cu2+ detection Kit is based on the color change of Lentikats Biocatalyst with immobilized recombinant yeast in the presence of copper (Cu2+) ions. The intensity of the color is compared with a series of control samples of Lentikats Biocatalyst. 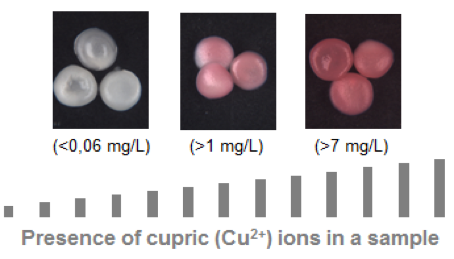 Based on the change in color intensity, the concentration of copper (Cu2+) ions in the sample can be determined. 5 syringes (5 mL and 20 mL) with a sharp needle. The detection limit for copper (Cu2+) ions using the Single-use LentiKatsÒ Cu2+ detection Kit is set to 1 mg/L for drinking waters and 0.5 mg/L for industrial wastewaters, in line with the maximal Czech regulatory limits. If necessary, the detection limit can be adapted according to the current needs of the user (e.g. for specialized establishment). The kit can be modified (recalibrated) to show a above/below color response to any desired concentration of copper (Cu2+) ions. Single-use LentiKats Cu2+ detection Kit uses Lentikats Biocatalyst with immobilized genetically modified (GM) yeast.